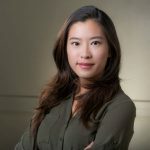 Ewina Pun joined the BrainGate team at Brown University as a doctoral student in fall 2018. Her research interest lies in designing decoding algorithms for closed-loop brain machine interfaces. Prior to Brown, she completed both bachelor and master degrees of science at the University of Southern California, majoring in Electrical Engineering and Biomedical Engineering, respectively.